USS Augusta CA-31. The Marine complement in the 1930s while future Gen. Lewis "Chesty" Puller was commanding. Photograph courtesy of Søren Swigart. This weapon was used on most US Treaty cruisers and the Lexington class carriers. None of these ships ever carried the "super-heavy" AP projectiles as their ammunition hoists could not accommodate the longer, heavier round. As commissioned, the early cruisers had poor dispersion patterns, sometimes as large as 2,000 yards (1,830 m) for a full salvo. Some of these problems were due to the guns having a very high muzzle velocity and poor shot seating. Extensive testing to determine the cause of the problems was performed in 1933 at Manila Bay with the assistance of the Coast Artillery and the results sent to BuOrd. Corrections included reducing the muzzle velocity and relining the barrels. These guns and mountings were removed from USS Lexington (CV-2) and USS Saratoga (CV-3) in 1942 and then reused as coastal artillery on the island of Oahu, Hawaii. 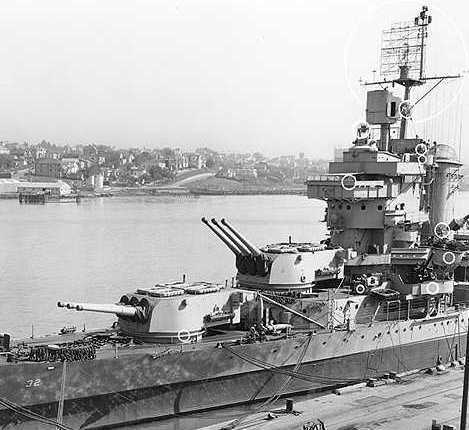 It had been planned to rearm these carriers with 5"/38 (12.7 cm) guns, but only Sarratoga actually received her new guns as Lexington was sunk before the work could be carried out. This series of 8" (20.3 cm) guns were very heavy when compared to most other 8" (20.3 cm) guns for reasons that are not readily apparent. Mark 9 was the original design and was used on ships built in the 1920s. This gun consisted of liner, A tube, jacket, five hoops, three locking rings and a screw box liner. 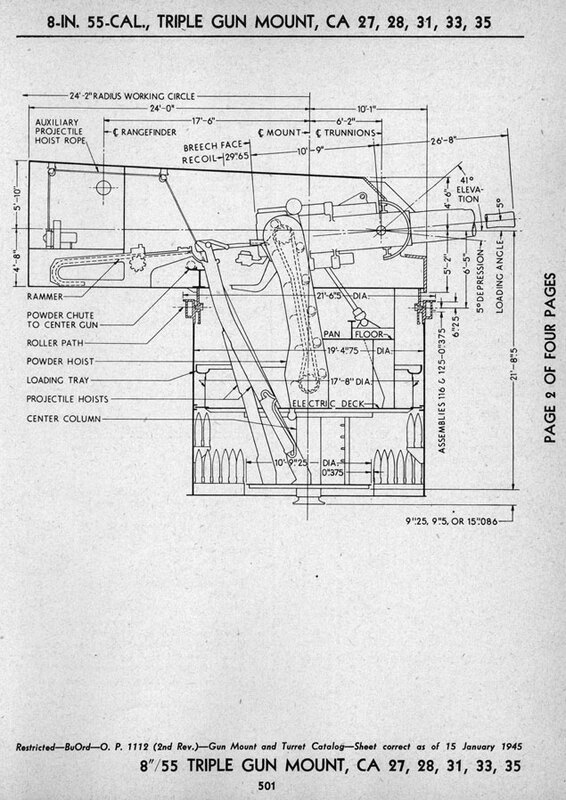 The Mark 10, which was never built, was a lighter gun constructed of only three hoops. Mark 11 had only one hoop and was autofretted. The Mark 13 was the Mark 9 relined with a partially chrome-plated bore. The Mark 14 was a relined Mark 9 with a fully chrome-plated bore and a smaller chamber. The Mark 14 was used for most regunnings during World War II. At the Battle of the Java Sea in February 1942, USS Houston (CA-30) was able to maintain a ROF of 5 - 6 rounds per minute during the early part of the battle, possibly through the use of "cue-balling" techniques. ^SP Common had a thin hood and a windscreen. Common had a windscreen but no cap. HC Mark 25 was designed such that it could be forged from the base end. 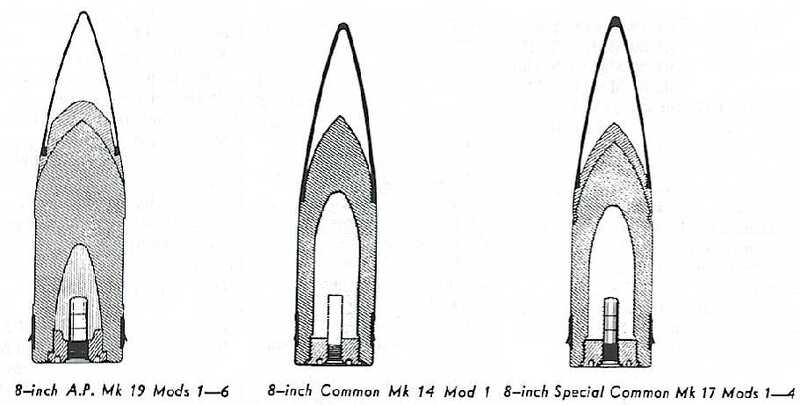 Common Mark 14 and Mark 15 shells do not appear to have been in general use during World War II but they still appear in a 1947 Explosive Ordnance publication. ^HC projectile bodies could be used with Point Detonating (PD) or Mechanical Time (MT) fuzes. When used with PD fuzes, they were considered to be HC rounds. When used with MT fuzes, they were considered to be AAC rounds. MT fuzes were probably set by hand on the loading trays. ^Radius of ogive for both AP Mark 19 and HC rounds was 83 inches (211 cm) or about 10crh. Bourrelet diameter of all rounds was 7.977 inches (20.3 cm). OP 1664 says that almost all 8" (20.3 cm) rounds were 36.0 inches (91.4 cm) in length. However, other sources and a careful examination of photographs and sketches lead me to believe that the lengths given above are accurate. ^The propellant charges were in halves. ^The Mark 9 originally had a muzzle velocity of 3,000 fps (914 mps), but barrel life was only about 500 rounds and accuracy was poor. ^Most of the 9-gun cruisers as commissioned were to normally carry 100 - 125 rounds per gun with a wartime allowance of 1,400 rounds per ship. 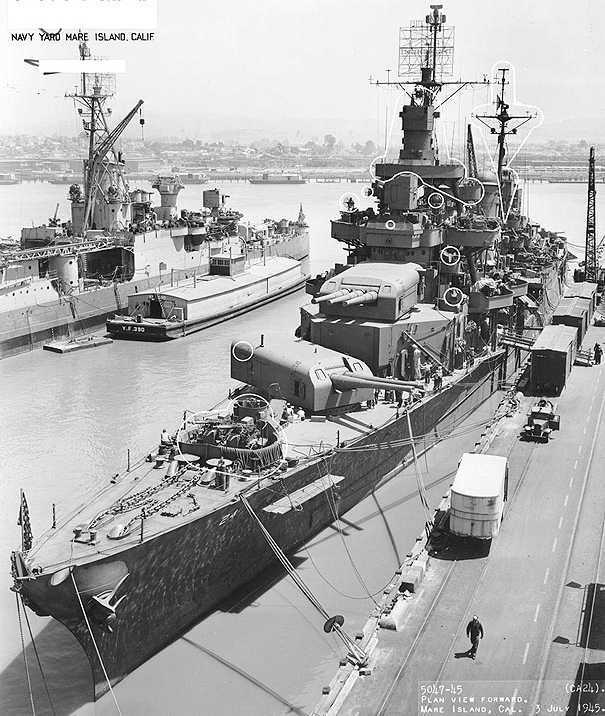 During the early part of the war, the Northampton and Portland classes carried 1,500 rounds per ship, but this was reduced during refits after July 1942 to just over 1,300 rounds in order to allow for added AA weapons. The New Orleans class was reduced during refits after August 1942 to 125 rounds per gun. These figures are taken from armor penetration curves issued in 1942 as shown in "US Naval Weapons." ^There were two different kinds of mountings. The earliest ones were officially classified as "twin mounts" and "triple mounts" rather than "turrets," as they had handling rooms directly below the gunhouse and did not have a rotating stalk. 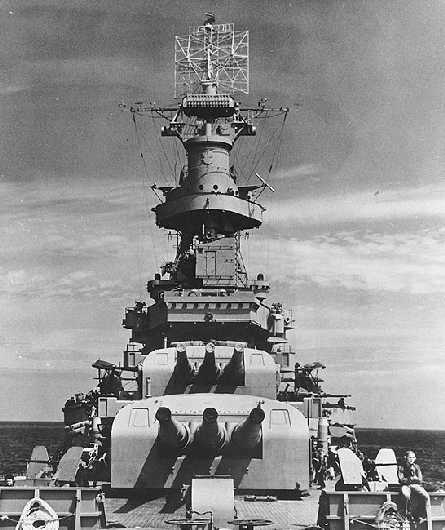 The later mountings used on New Orleans (CA-32), Astoria (CA-34) and Minneapolis (CA-36) were classified as "triple turrets" as they did have a rotating stalk. All of these mountings had the guns in a single sleeve. ^The carrier mountings were different in design than the from those used on cruisers and appear similar to the twin mounts used on the Omaha (CL-4) class. ^The shell and charge hoist arrangements in the earlier twin and triple mountings were similar to the later turrets, but the lower hoists were part of the fixed structure. The triple mounting in the Pensacola class (CA-24) had a 15 hp elevating motor and in all ships the upper charge hoists were powered by 3.5 hp motors while the lower ones were powered by 5 hp motors. The twin mountings were similar but had a 20 hp training motor and a 10 hp elevating motor. ^All mountings and turrets were electrically powered through hydraulic gear. The triple turret had a 30 hp training motor and an 18 hp motor that elevated the gun cradle. Each gun had a 7.5 hp ramming motor and a 7 hp motor for its pusher shell hoist. 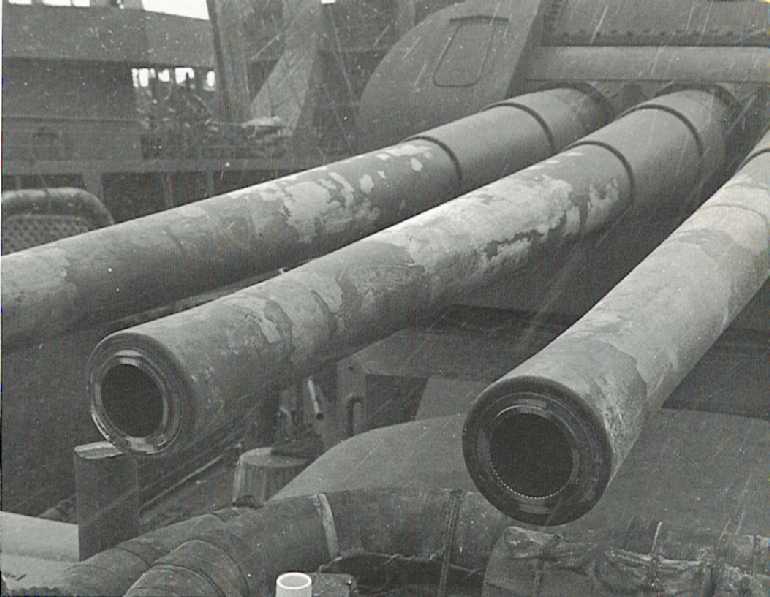 Each gun had a shell hoist in the stalk which ran directly from the shell room to the gun breech. There were two lower powder hoists that ran from the magazine to the handling room and were each powered by a 15 hp motor. The upper powder hoists were powered by six 1.5 hp motors. Shells were stored vertically on the fixed structure. RPC was used in the New Orleans class as built. RPC was fitted to surviving ships during World War II, except for Salt Lake City (CA-25). The gun axes were about 46 in (117 cm) apart for all mounting types. USS Pensacola CA-24 in July 1945. USS Pensacola was the first 8 inch (20.3 cm) "Treaty" cruiser built by the USA. Note the thick chase of these guns and the "boxy" look of the mountings, both typical of USN 8" (20.3 cm) designs of the 1920s. Rangefinders on forward turret have been removed. Putting the twin turret forward rather than the triple turret allowed a narrower bow form, thus making it easier to achieve high speeds. 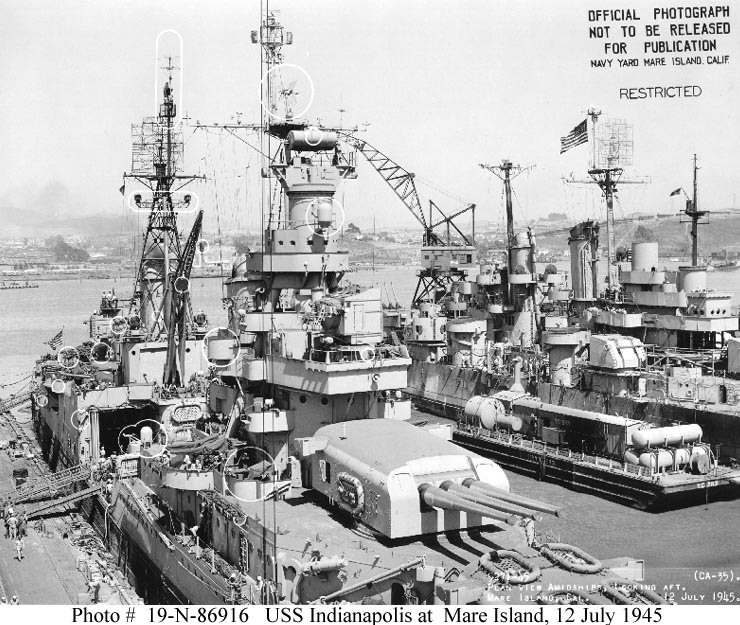 At left are USS Indianapolis CA-35 and the lighter YF-390. U.S. Naval Historical Center Photograph # 19-N-87792. USS Indianapolis CA-35 in July 1945. U.S. Naval Historical Center Photograph # 19-N-86916. USS Quincy CA-39 passing through Straits of Magellan in 1939. 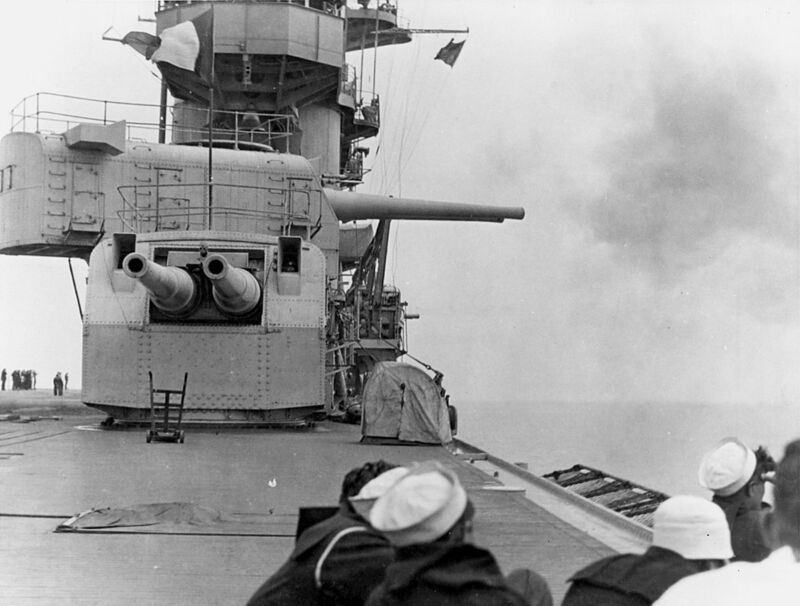 Note single periscope on the mounts, indicating that the guns were in one sleeve. U.S. Naval Historical Center Photograph # 83592. Bow mounts on USS Portland CA-33 in 1944. Note the Mark 8 FC Radar on top of the Mark 34 Director and the SK "matress" antenna on the foremast. At the very top of the foremast appears to be an SP radar antenna. U.S. Naval Historical Center Photograph # NH 82031. USS New Orleans CA-32 in March 1945. Note the different shape of these later turrets, built during the 1930s. U.S. Naval Historical Center Photograph # 19-N-80232. After mounts on USS Lexington CV-2 in January 1928. 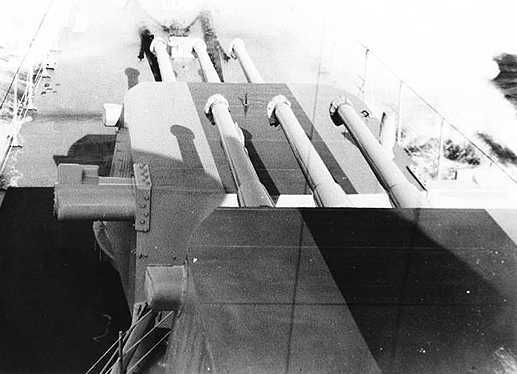 The ends of the barrels of the upper forward mount can just be seen in the center of the photograph. Note that only the upper mounting has a rangefinder. National Museum of Naval Aviation photograph No. 1996.488.011.002. 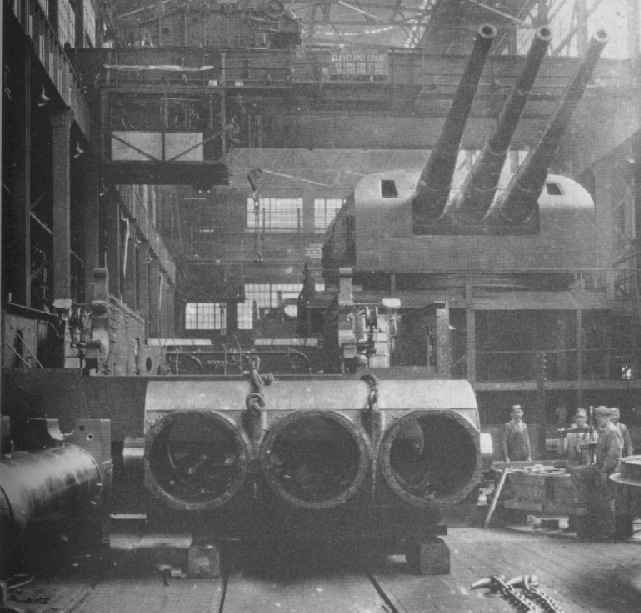 Mountings and guns intended for USS Louisville CA-28 under construction at the Washington Navy Yard. Note how the gun shield in the foreground was used to seal the gun port. Triple Mount on USS Salt Lake City CA-25. Blistered paint and extruded liners show heavy use. 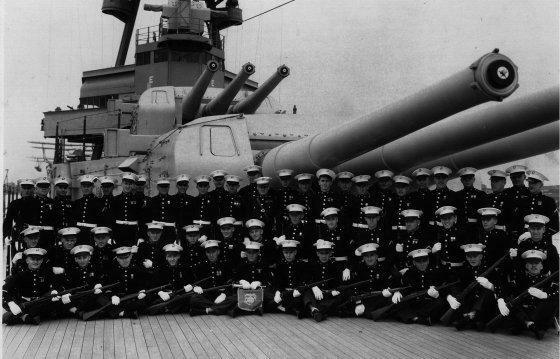 US Navy Photograph. 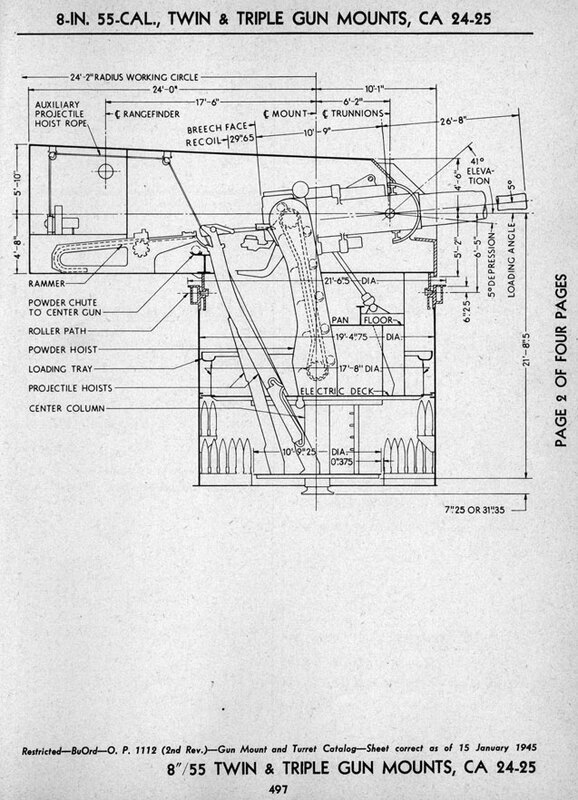 Cutaway sketches of 8" (20.3 cm) projectiles.